In her essay in our new issue, Debarati Sanyal analyzes practices of resistance as seen through film and photography set in the Calais’s “jungle” refugee encampments, which were razed last year by the French government. She discusses the interplay of humanitarian compassion and securitarian repression in the destruction of the camps, nuancing the view of borderscapes as sites of total biopolitical capture, and of refugees as “bare life.” Making a profound case for both art and resistance, “Calais’s ‘Jungle’: Refugees, Biopolitics, and the Arts of Resistance” is a compelling and visually stunning read. 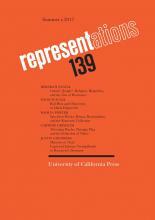 Upcoming in Representations 140–“Fallacies”: This special issue features essays by D. Vance Smith on fallacy and the origin of thought, Andrew Cole on Hegel’s “circles,” Branka Arsic on The House of Usher, Maureen McLane on “compositionism,” Alexander Nemerov on photographic evidence, Jonathan Flatley on reading for mood, Rey Chow and Markos Hadjioannou on the Hitchcockian “nudge,” Jonathan Kramnick on the fallacy of interdisciplinarity, John Durham Peters on technological determinism, and Charles Altieri on fallacy and its implications for contemporary literary theory. With an introduction by editor Elisa Tamarkin.